Think of your favorite song – what emotions are expressed in the lyrics, the music, even in the introduction? What feelings are evoked inside of you? What do you notice about your responses? Music can give shape and form to overwhelming feelings – anger, sadness, and frustration can all be hard to put into words, especially for a young child. Music is a way to identify some of those “hard to feel” feelings without getting overwhelmed. Music is an open container for a wide range of self- expression. Many parents find that their children respond positively to music. In my practice I often work with children with hyperactivity, anger, and poor frustration tolerance. Children with such issues can often suffer from poor self-esteem, and have trouble connecting with their parents, peers, and siblings. Music can be a powerful tool for kids to learn how to calm and ground their bodies, express themselves fully and feel understood, and learn coping skills for everyday use. There are many ways parents can integrate music into their child’s daily routine – responses will vary depending on the child’s age, verbal ability, and more, but I have found that most, if not all, children, will respond to music if it is used sensitively and with awareness. 1. Notice what music your child responds to. Pay attention to volume, tempo, and genres. Your child’s responses will likely vary from day to day, and differ on vacation days or school day, in the morning or in the evening. You’re just looking for some information. Some children who have issues with anger or hyperactivity respond very well to quiet music, others need to first move energy from their bodies with more up-tempo and energetic music before they can calm and ground. 2. Develop playlists. This may be a great project to do with your child. Explore different genres of music and choose songs that either help your child relax or feel grounded (remember that some people can feel grounded in the midst of African drumming or loud Sousa marches). Developing playlists shows your child that music can be used as a tool. The idea is that they feel empowered to either ask for it if they need it, or can independently initiate listening when they need it. Ask your child if they’d like to develop a playlist for various moods – sadness, anger. See if they can identify how certain music makes them feel. 3. Sing through transitions. If your child has difficulty with transitions, then sing through them. If you’re not comfortable making up songs, then rewrite the words to a song you know (“The Ants Go Marching” or “Twinkle”). Simple phrases, an easy, uncomplicated melody, and a strong, consistent beat are grounding and organizing. 4. Sing slowly. Parents are busy adults. It can be easy to try to get your child to calm down, but not realize that you are still talking quickly or loudly. Singing slowly is an easy way to kill two birds with one stone – you model calmness for your child and you calm and slow your own body down. If it’s hard to start slowly, then see if you can gradually get slower and slower. 5. Let there be silence. Ever heard the phrase “silence is golden”? Be aware of there being too much noise, or even too much music. Pause in between phrases as you sing to or with your child. Wait a moment before skipping to the next song on a playlist. Silence is a valuable tool – it provides a space to become aware of our bodies, our breath, and the present moment – all wonderful skills for a child to develop over time. 6. Say it in song. Songwriting can be a creative, fun way to self-expression. Try either free-form (improvise lyrics and music on the spot) or piggybacking (use the music of a familiar song and rewrite the lyrics). Model for your child what it’s like to be open. Write a song together about your day – as your drive home or as you give them a bath. Songs with movement may be useful too – for example, rewrite the words to “When you’re happy and you know it” as a way to introduce healthy coping skills, ie. “When I’m mad and I know it – I stomp my feet”. 7. Breathe through it. The breath is a powerful way to calm ourselves. For a child who is in the midst of a tantrum it may not be helpful to ask them to breathe, if they have not cultivated that experience when not in crisis. So integrate breathing into part of your daily routine – make it fun, make it playful, but make it consistent. Do deep breathing with your child before bed or before school. Perhaps use a bell or a wind chime to start. Make a sigh or a sound on the exhale. This is a simple and effective way of modeling healthy self-care for your child. 8. Use music for yourself. Do you listen to music on your own? 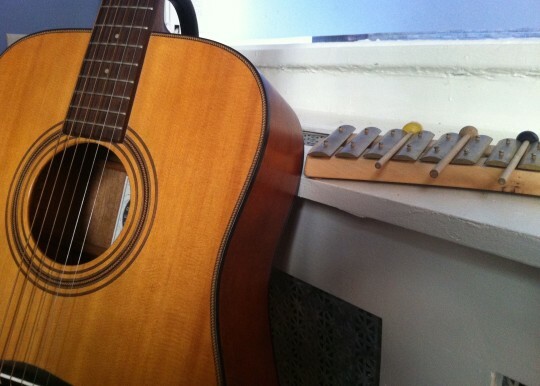 Did you use to play an instrument? Write songs? Adults often lose track of the playful, musical children they once were. Re-igniting your own passions and self-care routines can only help you be a better parent. Start with five minutes a day – sing in the shower, drum on the car steering wheel, belt out that Journey song you loved. 9. Play together & praise the positive. When children have difficulty with anger management or frustration tolerance, every day can feel like a struggle or long slog towards bedtime. You can use creative exploration of music as a way to connect and build happy, positive memories for both you and your child – Grab some maracas and play along with some recorded music. Sing in the car on the way to school. Use some scarves and dance around to music with your child. Play an improvised duet on only the black keys of that piano in the corner (there will be no “wrong” notes, I promise!). See who can hold a note the longest. Praise your child’s creativity, spontaneity, and playfulness. It is much more effective to “praise the positive” than to “nitpick the negative” and music can be a great way to create positive interactions and memories. By Maya Benattar, MA, MT-BC, LCAT. Maya is a board-certified and licensed music therapist with an NYC-based private practice, where she works with children of all ages and needs, and their families. Her holistic, child-centered approach utilizes individualized music-based interventions to address social, emotional, and developmental needs. For more information, visit Maya’s website, follow her on Twitter or like her on Facebook. You can sign up for her monthly email newsletter to receive blog posts and tips about music for child development and self-care here.